JayJay here. Jim will write about the comic book business and about his work, but he doesn’t often write about purely personal things. Mostly, no doubt, because his work has been the all-consuming thing in his life and he’s never really “off work” completely. 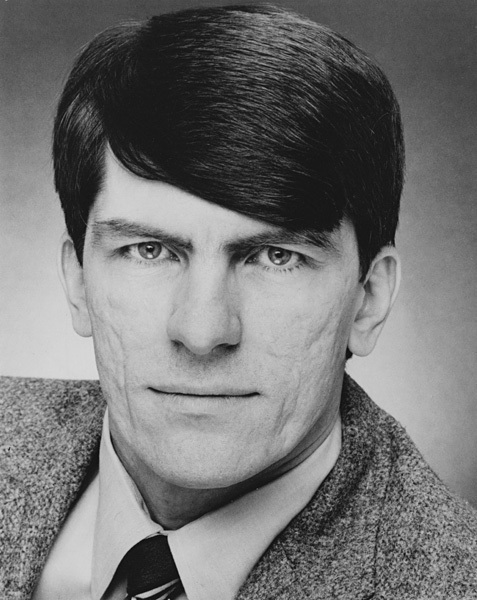 But two incidents stand out in my mind that define who Jim Shooter is to me. I first met Jim in July of 1983. At a Texas comic book convention that took place in a hotel in Houston. I didn’t know who Jim Shooter was, never had noticed his name in the comic books and mostly didn’t read those pages of text that punctuated the art in the comics. Also, I read the underground or alternative comics, what would now be called independents, like Elfquest and Cerebus and magazines like Heavy Metal. I didn’t regularly read a whole lot of Marvels, and no DC comics at all since I was about 8. I was helping out some friends who were putting on the convention, working security (I had a cool walkie-talkie headset and everything!) and filling in where I was needed. I had purposely worn my cutest punk-style outfit since in those days all it took to intimidate a lot of comics fans was a cute girl. In retrospect, maybe I could have gone with a “Diana Rigg, New Avengers” kind of thing… but I digress. Must…resist…fashion…talk. heh. I didn’t know at first that Jim was a part of the comic book convention since he was the only one wearing a suit, but my buddies quickly informed me otherwise… Me: “What’s an editor-in-chief?” I don’t even think THEY knew, exactly. On Saturday evening I was getting one of the hospitality rooms of the hotel set up for a party for the convention guests and then I was planning to leave (I don’t much care for parties full of strangers and I didn’t know any of the guests) but Jim arrived early (as he ALWAYS does) and we started chatting. We ended up talking most of the night. When the party got crowded (obviously, I didn’t leave after all) and loud, we stepped out into the hallway to talk more easily. Jim was turning on the charm (yes you were, Shooter, don’t deny it) and we were deep in conversation when a kid walked up to Jim, maybe about nine or ten years old. He wanted to know how Spider-Man’s powers worked. Jim didn’t say “G’wan kid, ya bother me.” or anything like that. Jim smiled at me and turned to the kid and explained to him in great detail, on a ten year old level but without talking down to him, how being bitten by a radio-active spider gave Spider-Man the ability to affect molecular adhesion so he could stick to walls and what that meant (!) and how he had built his web shooters and web goo because he was good at science. He then answered the kid’s questions about how Doctor Octopus’ metal arms worked, in detail, giving this young fan all of his attention until the kid was satisfied. I found it completely endearing. I could tell Jim loved what he did and loved sharing it with other people who loved it, too. Some years later, after I had moved up north to seek my fortune as an illustrator and had been hired by the lovable Danny Crespi to work in the Marvel bullpen as a designer, Jim and I used to hang out a few nights a week. One evening, coming back from having dinner, we were walking past an upscale hotel. A couple engaged in a loud argument was exiting the hotel and, as they headed for a late model Cadillac at the curb, the man tried to kick the woman from behind. Once they reached the car the man was angrily insisting that the woman get into the front seat and she was screaming her refusal. It was an extremely charged scene. We slowed down, and Jim paused and turned back, obviously disturbed by what was going on. Right about that time the man grabbed the woman by the hair and started trying to force her into the car. Without hesitation, Jim strode toward the couple throwing the sportcoat he had been carrying back over his shoulder. Did he know I was right behind him to catch it? I don’t know. But I caught it. He went up to the man and firmly ordered him to stop. Jim is a tall guy. 6’7″. Kind of imposing when he means to be, and sometimes even when he doesn’t. The man let go of the woman’s hair and went around to the driver’s side of the car and reached under the seat to get something — we couldn’t see what. He came back and faced off with JIm, holding his hand under his shirt, claiming to now have a gun tucked into his shorts. The only thing I could figure to do was stand close beside the man and watch him like a hawk, thinking that if he did draw a gun on Jim (if he even really had one) I might be quick enough (martial arts training) to be able to push his hand (with the possible gun) away from us. There were other spectators and hotel employees watching the scene about a dozen yards away by as well. Calling the police, I assumed. The man was extremely agitated, yelling and threatening and getting in Jim’s face and Jim simply continued to firmly insist that the guy wasn’t going to hurt that woman in his presence. By now the woman was screaming at the man to get in the car (yes, the same woman who had only a minute ago been violently grabbed by the hair — go figure). Jim didn’t escalate the situation, he just remained firm with the man that the violent behavior wasn’t going to be tolerated. And the guy backed off. He went and got in the car all ready to drive off in a huff (with the woman, now in the car) and was looking all around… he couldn’t find his keys. Jim walked over, took them out of the passenger side door and held them up to the window. Embarrassed and deflated, the man got out and Jim handed him the keys. He apologized for losing his temper and told Jim “That’s some woman you’ve got there.” (You didn’t think this story was ONLY about Jim, did you?). The couple then quietly got in their car and left. Probably to continue their raving psychodrama elsewhere, but hey. What can you do? Does that make Jim sound like a hero? Well, that’s ok. That’s how I see him. We’ve been friends all these years. We’ve worked together and hung out. Jim has encouraged me, mentored me and occasionally even employed me. He’s had faith that I could accomplish things I wasn’t sure I could do. We’ve had disagreements and ups and downs and I’ve seen him go through a lot of hard times and pain, but he’s always been a loyal friend and a brilliant inspiration. In his heart Jim really believes in the kind of heroism that he writes about. Not just as a concept. To him it’s a very real and present thing. And it must be contagious because knowing Jim has had a profound effect on my life and the way I view the world. 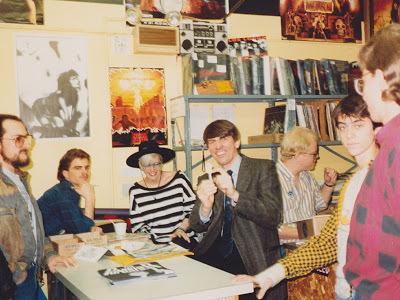 A picture of me tagging along with Jim to a signing, some time in the 80’s. Once, I was on the F Train going home to Queens Village late at night. There was a young couple sitting across from me. A large, man, drunk, on drugs, or just crazy started menacing them. He got right up in front of them, way too close, and started saying despicable things to the young woman and the young man, who was, maybe a foot shorter than the thug and half his weight. I didn't know what to do. I thought, "If he touches them, or if they ask for help…." I'm a big guy, but this guy was big enough that there was no guarantee that I could handle him. The tense situation went on for a few minutes. It got steadily worse. That young man was suffering and his girlfriend was terrified. Then, as we were rolling into the 23rd and Ely station — a funny little in-between station where I'd never seen anyone get on or off — a fellow got up, approached the menacer, clapped his arm around the guy's shoulders and said, in the friendliest way, words to the effect, "Hey, how are you? I haven't seen you for a long time! What's going on, friend…?" Etc. The thug was confused. Just before the doors closed — a bell-tone tells you when that is about to happen — the fellow shoved the menacer out the door onto the platform. The doors closed and away we went before the thug could regain his balance. Genius. I wish I'd thought of that and had the cool to pull it off. And I told the fellow so. A somewhat less dramatic incident happened recently when I was filling up at a gas station. An SUV driven by a teenage boy with several teenage girls as passengers pulled in for some gas. As the skinny kid was filling up his car, a van drove up and parked in the middle of the roadway. A bulky, jock-type kid stormed out of the van and approached the skinny kid. There was unmistakable rage in his eyes. From my vantage point I couldn't see anything below their heads but I heard the skinny kid say "ow" followed by some conversation and him saying "you're STILL hung up on that?" A conversation continued and it seemed like the kid had the situation under control. I kept my eye on it but didn't think I needed to potentially emasculate him in front of the girls by making it look like he needed an older guy to bail him out. At that point their conversation ended and the jock kid walked up to the window of the SUV and started talking to one of the girls. I was done filling up by this point but I sat there with my eye closely on what he was doing and decided not to leave until he or they were gone. Eventually their conversation ended and the skinny kid and the girls drove off without further incident. Then there was a disturbing footnote. The jock kid pounded his fist into the side of his van as hard as any human possibly could. Then he repeated the action in rapid succession several times. I'm pretty sure it left a dent. At this point I was thinking that Jesus Christ, Superman or Spider-Man would have some inspiring words to say to this kid that could possibly instruct him on how he was going down a dark and dangerous path with his life and needed to turn things around. I couldn't think of any words though. He left and I left. What I think I've learned from these situations is that the hardest thing is not finding the courage to act, but finding the wisdom to make the right moves and say the right things. You are really required to think on your feet at times like these. I know you can learn self-defense tactics to physically defend yourself, but what about learning how to actually defuse the tension and perhaps prevent violence? I remember the story a few years ago of Ashley Smith who was kidnapped by escaped murderer Brian Nichols and was able to talk him into letting her go. She also apparently calmed him down enough so that he surrendered to police without a fight. Perhaps more of us need to learn skills like these and be better prepared to calm someone down who's about to hurt us or someone else. Of course, if all else fails, it would help to know karate. It's hard for me to imagine any able-bodied adult male doing something differently when confronted with the situation of a woman (or a child or disabled person) being physically mistreated. I would hope the percentage of men who would step up like Jim did would be high, but I really don't know and it's easy to have doubts. I've been in a similar situation or two myself and it's interesting what goes through your head at that point. It feels like the driving force could be a pure instinct to protect someone weaker but it could also be coming from a sense of morality that's been learned. I have three role models when it comes to situations requiring moral courage and they are Jesus Christ, Superman and Spider-Man. Morality isn't that complex when you can ask yourself what any of those three individuals would do in a difficult situation and immediately know the answer. Unfortunately this type of violence isn't just a big city thing but also happens in the ostensibly more peaceful suburbs. A few years ago, I was renting part of a shared house in which a married couple also resided. It was no secret that they had their fair share of arguments, sometimes noisy ones. In recent weeks, the tenor of the situation seemed to be going further downhill. One night while relaxing in my room I heard a woman's scream coming from downstairs. It was anything but business as usual. I ran down to see what had happened and found the husband basically attacking the wife and her trying to defend herself. She had been hit, there was no question about that. I literally had to pull them apart, get between them and hold him back, maybe her too. I repeated a refrain telling everybody to calm down. Just my presence there seemed to shame him into calming down somewhat. He never tried to attack me, but after a brief lull he tried hard to get past me to his wife. He was apparently under the influence of alcohol and/or drugs, so he wasn't fighting particularly well, but wasn't behaving rationally either. She kept yelling at me to call the police. She seemed to think she was tough enough to fight him back on her own if he went after her, but I had already seen her starting to lose that battle when I came downstairs. I couldn't look for my phone and call immediately because I needed to stay right there between them, keep my hands free and my attention focused. I said that we were going to call the police. Eventually he groaned, turned around and disappeared out of the back of the house. I took her upstairs and let her use my phone to call the police and explain the situation. I stayed with her as they showed up and we gave our statements. Of course, she refused any of their suggestions to leave. After they left she told me she'd be fine sleeping in her room. The next day when I came home from work, I found him sitting on the couch. He told me they "made up" and everything was fine. I told him what I saw last night was not the kind of behavior I can tolerate. The next time I saw him and his wife together, it looked like business as usual. As for me, within a week I had packed up my things and moved out. I only wish the women in these situations found themselves capable of doing the same thing. That con in Houston was my first. I recall Jim was always very gracious and helpful with new talent trying to break in, always taking time to kindly look at portfolios and give impromptu lessons on storytelling. He was holding such a session when he saw samples from Bill Willingham (from the first Elementals story) and gave him an inking job. I think that ComixFest was my first convention. I've still got my badge from it, covered in autographs (including Mr. Shooter's). Small world. A few months ago, I was driving home from a caricature "gig." Part of the trip back included as stretch of road that was poorly lit, and in a pretty rough area. As I drove, I saw a man shoving a woman into the passenger side of a car. He was being rough. I pulled in the parking lot as fast as I could, and opened my car door in front of me, worried the guy might have a gun. The parking light was totally dark, and no other people were anywhere nearby. The guy staring back at me looked like a thug, and no, I don't care how improper that sounds. Long and short, I was scared. I mean SCARED. All I could mutter was: "Are you okay?" The girl turned away from me, and the guy straightened his cap. "Yeah, we're alright." I drove about half a mile down the road, and just up a hill. I called the cops, and watched as the car drove by. Every once and a while, I remember that situation and wish I could have done more. When I think about how afraid I was in that situation, a swell of respect washes over me for people like my brother and Jim. I don't think they're fearless. I think they just hate watching one person victimize another. It's a great and rare thing when a hero in one sphere of life can become a hero in another too. wowowowowo this was a great post and Jim Shooter is now my hero. I have always admired him and I never understood why so many other comic book fans had problems with him. I am not old enough to have enjoyed the period when Jim was EIC at Marvel but I read many of his stories, I was a big fan of Defiant (I want it back!!!) and Valiant. This post made me want to go to my comic shop and buy all the new Solar and Magnus!!! JayJay, great piece – inspiring in its narrative of courage and friendship. I can only think back to what my dad used to say… "You are a prince and a gentleman, there are so few of us left." Great blog Jay Jay! Mr. Shooter IS a HERO! Don't mean to sound so formal but, Mr. Shooter is a god in the field of comics. Didn't realize you were a woman till I visited your website. Love your art. Surprised I haven't heard of you before this blog. JayJay, thanks for sharing this with us, and I really appreciate that you and Mr. Shooter are keeping this blog alive and well, and updated often with great stuff. What TheWriteJerry said. My jaw dropped when I read the part about the guy grabbing something from the car. I had to stop for a moment. Obviously I knew that you and Jim had survived, but still … wow. You just took my admiration for him to a whole 'nother level. Thanks! My phrase "stories about him" could make Jim sound like a distant figure. But he's not. I appreciate the way he reaches out to us fans. To that boy at the convention. I was ten when I first got into Lee and Ditko's Spider-Man. That boy could have been me! Jim still remembers what it's like to be "a little kid playing super-heroes in the backyard," as he put it in his article about the scripting of SOLAR. Little kids in comics generally turn me off, though three exceptions come to mind: Louise Simonson's POWER PACK, THE GOOD GUYS, and Tammy from KNIGHTS ON BROADWAY. A real life good guy writing about Good Guys? Makes perfect sense to me. Great story, Jay Jay. Thanks for sharing! I was at that ComixFest '83 too! I still have the program. One of the coolest "real person as superhero" stories ever.